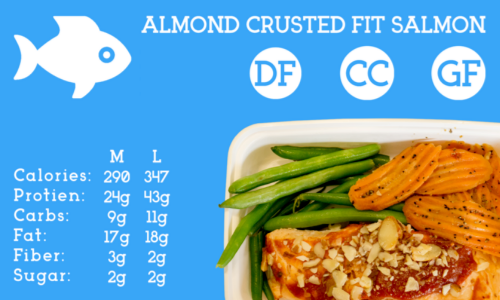 Sweet and spicy glazed salmon crusted in almonds, served with steamed green beans, and honey roasted carrots. Coconut crusted shrimp mixed with pineapple and jalapeño rice. Sauteed Gulf shrimp on a bed of Zoodles. Finished with pesto and topped with garlic roasted tomato sauce. 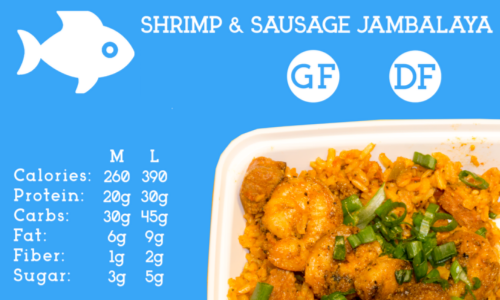 Sausage jambalaya made with brown jasmine rice and topped with blackened shrimp. 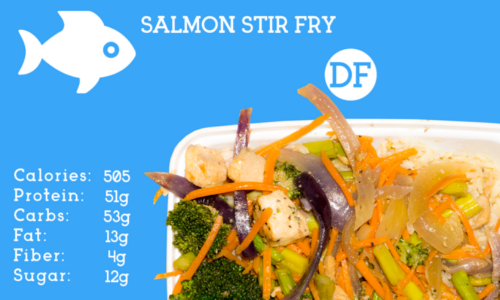 Salmon with a stir fry of asparagus, broccoli, and onion over steamed jasmine rice.